Update: Bianna Golodryga has since left “CBS This Morning” and CBS News but the newscast has continued to use the desk without the wings. 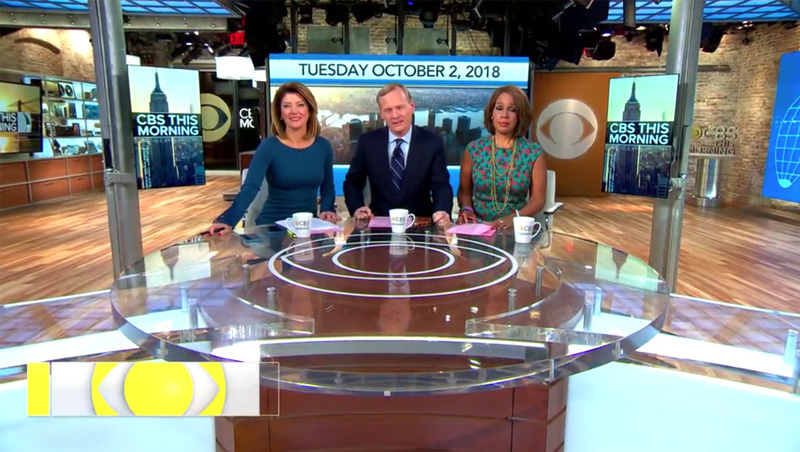 When announcing Bianna Golodryga officially joining “CBS This Morning,” the show — thankfully — updated its opening shot to give everyone a bit more personal space. 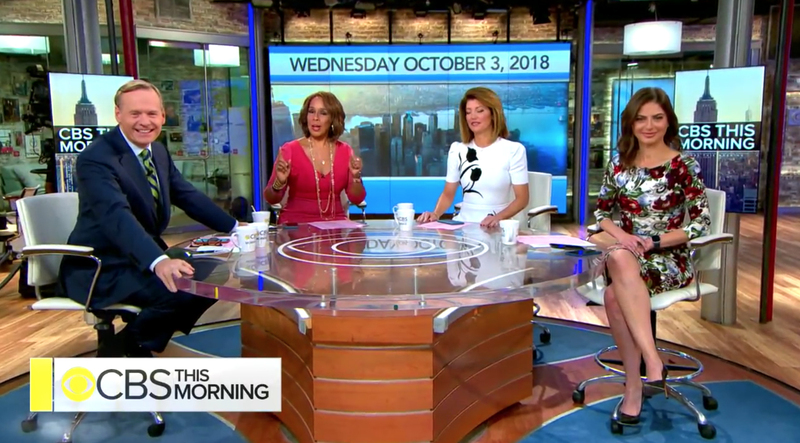 Previously, co-hosts Gayle King, Norah O’Donnell and John Dickerson would sit on one side of the desk in a brief shot at the top of the show. 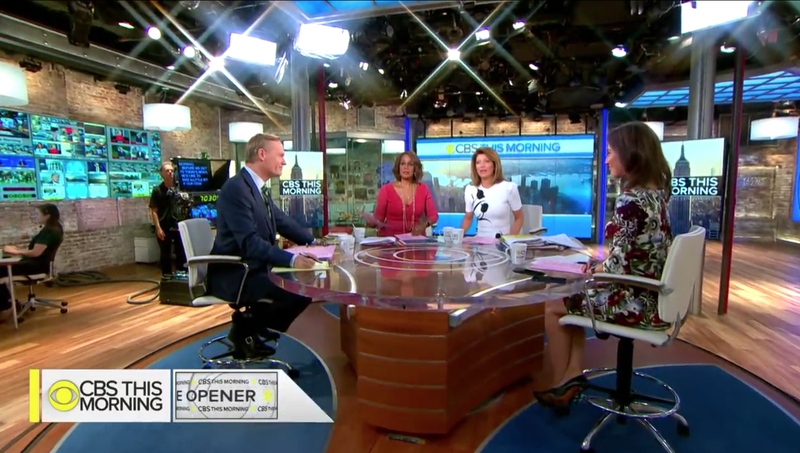 The anchors typically would appear briefly on camera again before the show’s “EyeOpener” segment but appear in a different arrangement afterward. Studio 57’s anchor desk, which is modular, features a center circular segment with the CBS eye logo emblazoned on it as well as three removable “wings” that can be moved, allowing for a variety of seating configurations. The three spaces created by the wings could comfortably seat two hosts — or, in a pinch, three, as in the old opens. This type of configuration allowed each co-host to have his or her own part of the desk and created a “roundtable” like setup. When additional people needed to join the anchors in studio — whether it be a guest or reporter, two of the anchors could share a segment or leave the desk altogether. Since moving to Studio 57, “CBS Evening News” has switched to used the anchor desk without the wings for most of anchor Jeff Glor’s segments. With Golodryga joining the “CBS This Morning” team full time Oct. 8, 2018, the show appears to have banished the wings to the sidelines. For the opening shot, the show wisely opted to not try to squeeze four adults on one side of the desk — instead having Golodryga and Dickerson sit on the far left and right side of the desk with their chairs turned more toward the camera. Once the show started, Dickerson and Golodryga swung their chairs around slightly to achieve a more roundtable-like layout.